Know, O Prince, that between the years when the oceans drank Atlantis and the gleaming cities, and the years of the rise of the Sons of Aryas, there was an Age undreamed of, when shining kingdoms lay spread across the world like blue mantles beneath the stars- Nemedia, Ophir, Brythunia, Hyperborea, Zamora with its dark-haried women and towers of spider-haunted mystery... Zingara with its chivalry, Koth that bordered on the pastoral lands of Shem, Stygia with its shadow-guarded tombs...Hyrkania whose riders wore steel and gold. But the proudest kingdom of the world was Aquilonia, reigning supreme in the dreaming west. Hither came Conan the Cimmerian...black-haired, sullen-eyed, sword in hand, a thief, a reaver, a slayer with gigantic melancholies and gigantic mirth to tread the jeweled thrones of the earth under his sandaled feet. This summer, Rittenhouse Archives will take Conan fans under the covers of myth and legend and inside the pages of "The Savage Sword of Conan" with their Conan: Art of the Hyborian Age Trading Cards. This unique series features some of the most stunning interior artwork from the pages of "The Savage Sword of Conan" magazine. What makes it unique is that the original artwork was done in black and white and this set will feature for the first time, this amazing artwork in FULL COLOR! 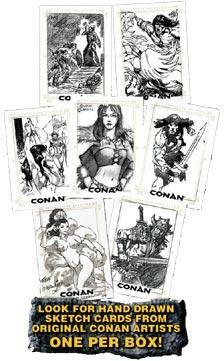 Artwork from classic Conan artists such as John Buscema, Pablo Marcos, Ernie Chan, Rudy Nebres and others! The set will also feature some incredible subsets as well including: Ode to the Cimmerian - a collection of poetry and artwork from The Savage Sword preserved in its original black and white (1:4 packs). Savage Sisterhood - striking pinups from The Savage Sword beautifully colored for the first time (1:8 packs). Rise of the King - the journey from Barbarian to King (1:40 packs)! Sure to be the most sought after of the chase cards will be the hand-drawn sketchaFEX cards from original Conan artists! Each card is hand-drawn and no two cards are exactly alike. Artists such as Warren Martineck, Geoff Isherwood, Mark Pennington, Pablo Marcos, Dan and David Day and Darren Auck have lent their talent to create some incredible pieces including a few in vibrant color! Fans and collectors will also be able to store their collections in a custom designed collector's album which contains an exclusive sketchaFEX card and an exclusive promo card.